How about a word from the owner of Centric Cleaning instead! We take heart in all that we do, because Centric Cleaning is our life’s work! Our trained technicians are perfectionist, and as a business we never leave a job until it’s as perfect as we can possibly make it. Our standards separate us from others in the industry. We’re reliable and will always be on the job when you call! With having 20 years’ experience and coming from a family of professional cleaners, we’ve cleaned almost anything and everything. We love what we do, and because our work is our passion, each job is an opportunity to prove that we’re not your typical contractor… We’re your cleaning specialist! At Centric Cleaning, our mission is to provide customers with reliable and economical cleaning beyond the industries set standard, and that’s exactly what we’re doing. We specialize in all things cleaning related. 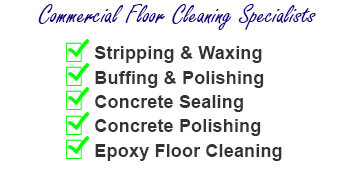 Tile and grout, floor stripping, buffing and waxing, We do all of these and so much more. We’re equipped with the industries greatest cleaning machines. Our focus is saving our clients time and money by providing them with a one stop shopping experience, where all of their cleaning related needs can be handled with one call! 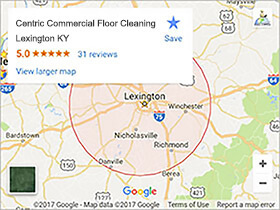 Currently our Service Area consists of Lexington, Georgetown, Richmond, Winchester, Frankfort, and Nicholasville KY. We can and will go further out for large commercial projects. As the future unfolds we hope to be able to service all of Kentucky with our cleaning services. Last but not least I would like to add that we’re a family owned business, always has been, and always will be. The next time you find yourself looking for a professional to tackle any cleaning project; I encourage you to contact us so we can save you time and money! We would love to have the opportunity to provide our services and to earn your business.